Sock of the month club subscriptions make an ideal and affordable gift option for friends, family, and colleagues. You can also add an upgrade to your own personal style and we have lots of tips around how to pair socks with our outfit, especially if you are wearing dull shirt colors. With the boom in eCommerce, buying socks online has never been more convenient or easy, and the emerging subscription trends have solved the basic problem of needing a fresh set of socks on a regular basis. Two of our favorite sock of the month clubs are Say it with a Sock and Ozone Socks. Ozone Socks is an eCommerce sock site that offers a sock subscription for both men and women, and Say it with a Sock is a leading sock subscription site with a variety of options. Ozone Socks sends you one pair of sock each month but doesn’t give you a choice of the specific pair. This makes your life quite simple as they take all the hard decision making out of the sock buying process! Comparatively, Say it with a Sock gives you the choice of receiving 1 pair, 2 pair, or 3 pairs of socks each month in your package. Ozone Socks offers two pricing options — a 6-month prepaid subscription for $75 or a 12-month prepaid subscription for $150. This equals about half the price of buying their socks retail. None of the Ozone Socks subscription plans auto-renew, and you can choose a subscription for either men or women. Say it with a Sock prices start at $11.99 per month for 1 pair of socks, and then it’s $8 to add a second pair or $14 to add two more pairs each month. With Say it with a Sock, you can pay in advance to save money. 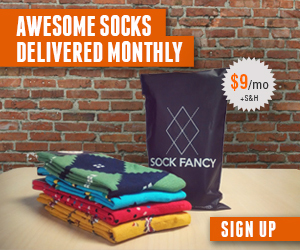 What’s your favorite sock subscription available on the internet these days, especially with the boom in subscription eCommerce? If you have a preference between Ozone Socks and Say it with a Sock, let us know in the comments below!